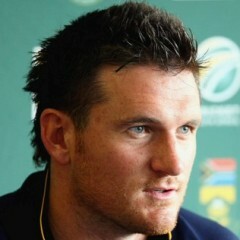 Cape Town – Hmm, Graeme Smith: so clearly the natural and most suitable leader ... but just not actually captain. That is the slightly strange (his admirers might still insist illogical) dynamic in the current, imperfect South African one-day international team. Of course the Proteas do need to keep the future in mind, particularly as “Biff” turns 32 on Friday, the very day when he leads out a Test team for the 100th time when his country embarks on the first encounter with Pakistan at the Wanderers. The beefy left-hander also deserves, frankly, the opportunity to focus more single-mindedly on his batting -- at the very least in the limited-overs arena -- and not have to obsess as much about such issues as field placements, bowling changes and the diplomatic cares that go with captaincy. But there is also a slightly uncomfortable feeling about watching the present Proteas teams, in the two shorter versions of the game, go a little erratically about their business in those environments while AB de Villiers and Faf du Plessis cut their teeth as skippers and make errors, many of them understandable and inevitable, in the process. At Potchefstroom on Friday, where South Africa beat New Zealand by a whisker in the dead-rubber final ODI to avoid a particularly galling whitewash, we only got strong reminders of Smith’s rich experience and sheer, steely “presence”. Everything about him just oozed leadership and responsibility, really, as his 10th ODI century provided the all-important foundations for the Proteas’ last-gasp triumph through Ryan McLaren’s unlikely, delightfully innovative paddled six off James Franklin. Many critics have always been curious about whether Smith would actually be able to make the rare switch from skipper to ordinary soldier, given that he was so born to leadership. The answer is probably yes and no -- no, in the sense that all too often he continues to look the most comfortable man in charge, even if no officially so, and yes because we may be seeing encouraging fruits at the crease from his very relief from the captaincy portfolio. Still, you could also sense -- as he anchored for the best part of the night session the SA chase -- his frustration as a succession of the Proteas’ younger or at least less regular players rather frittered their wickets away, a situation generally unaltered from the respective losses in Paarl and Kimberley. It is true that Smith holed out himself at an inconvenient, potentially perilous time, but by then he had overwhelmingly done his bit – or should that read lot? – toward a lopsided scoreboard where his innings was the individual standout by a long, long way. He had occupied the crease for 45.4 overs, a lesson in application and determination for the various rookies. The jury will remain out, by and large, on such customers as Quinton de Kock, David Miller and Farhaan Behardien, although I would suggest that Colin Ingram and bowling all-rounder McLaren have well nigh secured their ongoing squad employment for the ODI portion of Pakistan’s visit and perhaps into the more important Champions Trophy in England to follow in June. Similarly, that man GC Smith has stamped himself as an absolute must for the ICC tournament gathering, regardless of how he fares (or, indeed, if he even plays) against the Pakistanis preceding it. He is a revered figure in England, after all, and has often reserved some of his best personal cricket – granted, much of it at Test level – for their fairly unique conditions. It is necessary to emphasise his fresh hold on an ODI spot because towards the back end of last summer he did flirt a little uncomfortably with the axe from South Africa’s 50-overs plans, through under-delivery for some time with the blade. But when the going gets tough, the tough get going, and in this particular series against the admirably gutsy, giant-killing Black Caps, Smith has echoed what he did at the back end of the similarly home series against Sri Lanka in 2011/12. Against, the Lankans, he registered his best scores in the last two encounters (68 and 125) and much the same has applied against New Zealand: 66 at Kimberley and now the 116 at “Potch”. En route to his century on Friday, Smith went past coach Gary Kirsten’s career tally (6,798) of ODI runs, to move into third place among South African run-getters on 6,887 at an average of just under 40 and healthy strike rate of 81. Ahead of him are only Jacques Kallis (fifth worldwide, with 11,498) and Herschelle Gibbs (8,094). It is interesting to note that for all his undoubted, big-hitting appeal as a limited-overs drawcard, Gibbs’s average is lower than Smith’s at 36.13 and his strike rate only a little superior at 83.